Welcome to the Ships' Timbers Blog. We use our blog to share information about various museum activities. This might include our exhibitions, events, research, recent acquisitions, and articles of general interest. It's a place to share a thought, and we'd be delighted to hear from anyone who might be interested to write a Blog post. On Friday 9th May, 2014 Ships' Timbers met with representatives of the Deganwy History Group to visit the Bryniau Tower. Ships’ Timbers has been researching and developing a large maritime heritage project over the last 12 months called ‘For Those in Peril on the Sea’, an aspect of which includes Coastal Defence, and local heritage features relating to that. One of the features we will be including in this project is Bryniau Tower. 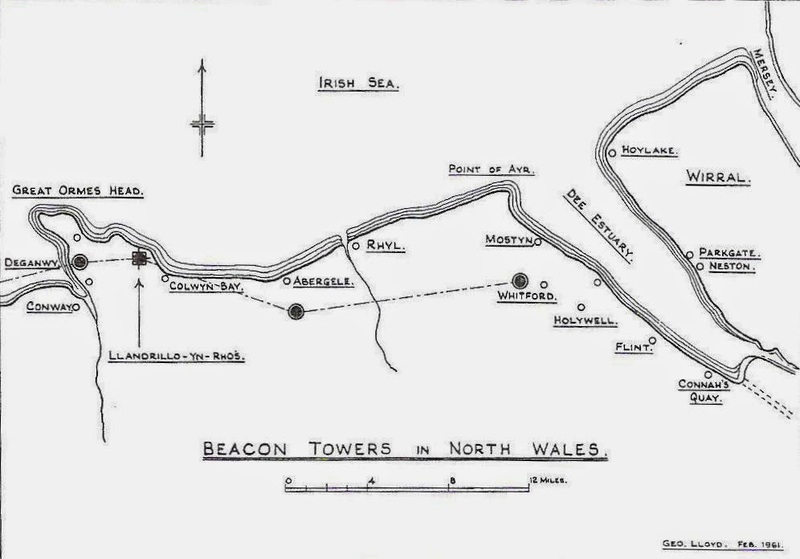 We will be carrying out a detailed resurvey of the Tower, and a review of its history linked to the other watch towers along the north wales coast. As the Deganwy History Group is an active research group we thought they might like to get involved with our work. We gave a presentation about the ‘For Those in Peril on the Sea Project’ to the Committee of the Deganwy History Society earlier in the year and further to that arranged a site visit. All said we had a very enjoyable and interesting visit to the Tower. Bryniau Tower is an isolated ruined semi-circular shaped structure located on the south-west end of a low ridge near Bryniau Farm, approximately half a mile north of Deganwy Castle. It stands at an altitude of 80m. The rough coursed purple grit walls are approximately 5m high with internal set-backs. In plan it forms a 240 degree sector of an annulus of 4m internal diameter. As an introduction to the history of Bryniau Tower, there is an interesting summary written by George Lloyd in Archaeological Cambrensis, Vol. 113 (1964) called Beacon Watch Towers of the North Wales Coast. Lloyd’s article includes the watch towers of Abergele, Whitford, Llandrillo, and Deganwy. The general reason given in this paper for building the towers is as a means of raising alarm along the coastline of imminent danger from Pirates. For centuries the coasts and shipping of Britain had been subjected to Piracy, this was especially so during the first half of the seventeenth century when James I and Charles I allowed the Elizabethan Navy to become so depleted that our shipping and coasts were at the mercy of pirates. In ‘England Under the Stuarts’ (1960), Trevelyan writes, ‘Though our armed trading ships showed stout fight against pirates of every nation, the Royal Navy did almost nothing to protect them even in the Channel. Between 1609 and 1616 Turkish Pirates from Algiers guided by English renegades took 466 of our merchant vessels; in 1625 they carried off 1,000 of our seamen as slaves and took twenty seven vessels in ten days’. 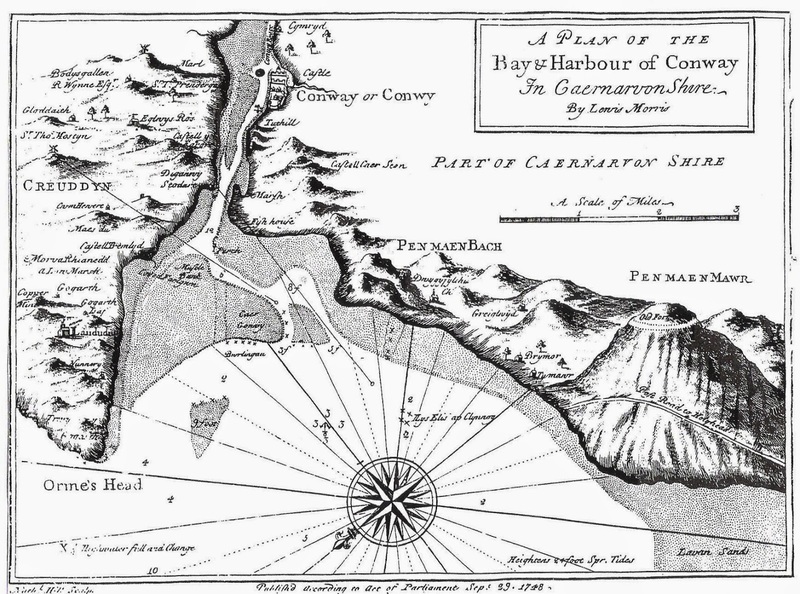 There are four references in the ‘Gwydir Papers’ to Piracy along the north wales coast during the 17th Century. In one letter dated 1649, a reference is made to a dispute between the Earl of Leicester and Lord Bulkeley, and states, ‘that there were goods in Anglesey which were in danger of being taken away by Wexford Pirates’. During the first 40 years of the seventeenth century, law and order in this locality rested upon the powers of Sir Thomas Mostyn (1535 – 1618) and his successor Sir Roger Mostyn (1559 - 1642). Sir Thomas Mostyn held a number of important positions and was the largest landowner from the Dee to the Conwy. It would have been his responsibility to protect the inhabitants and coastal shipping from pirates whose lairs were in the creeks of the Isle of Man and Ireland. Similarly, Sir Roger Mostyn would oversee all local improvements including defence against pirates. It is likely then that these watch towers were built during the time of Sir Thomas Mostyn and were manned to provide a warning, by flame or smoke, of the imminent strike by pirates, and marauding bands. Not as single units, but as a series of coastal watch towers they would communicate with one another by beacon covering a stretch of coast of about 50 miles on which were located the notable houses of Mostyn, Talacre, Penrhyn Old Hall, Gloddaeth, and Bodysgallen.